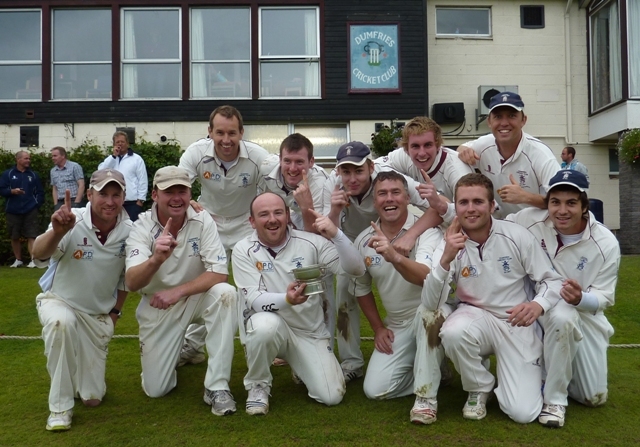 APD Dumfries took the Scottish Championship title away from leaders West Lothian on Sunday in a top of the table decider at Benfield Park Nunholm with a convincing seven wicket win. That earned the side promotion, for the first time, to the Premiership and the top league in Scotland. 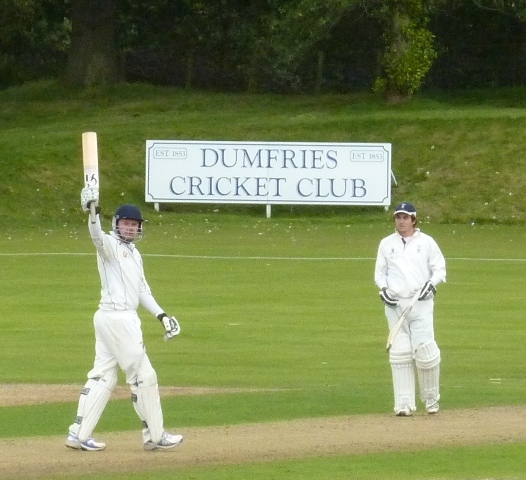 Dumfries put West Lothian in to bat and Allan Maskrey produced the desired start with an lbw decision second ball. Five overs later he added another wicket, bowled. Smith and overseas player Cookson set about consolidation. However the match swung when Beveridge had Cookson caught by keeper Corbett-Byers for the top score of 39. Next over Jim Patterson got Smith caught, and Black bowled, leaving his first ball. Then Dixon debated a second, was run out and West Lothian were in strife at 71 for 6. That Dumfries momentum continued when McCutcheon followed up with two more wickets. However West Lothian were resisting well. Thomson (23) and Raven (20no) pushed the score towards a competitive total but the former was superbly bowled by McCutcheon. However a couple of sixes landed on the pavilion before Beveridge trapped Bennie lbw in the last over for a final total of 148. Dumfries looked to have negotiated the opening overs until Dawson was given lbw to Thomson and then Tom McBride was caught behind to make it 28 for 2. It required a crucial partnership between Benfield Man of the Match Scott Beveridge and Chad Breetzke to ease concerns. They played steadily until a loose over from Smith was smashed for eighteen by Beveridge and 81 for 2 was immediately healthier. Although Beveridge survived a couple of chances he went on to an excellent fifty only to be bowled behind his legs after a ninety run partnership. Skipper Corbett-Byers contributed boundaries and then Breetzke hit straight for the winning four to successfully finish the innings for Dumfries with a 38no punctuated with punishing attacking shots. That sparked Dumfries celebrations and more after the Championship trophy was presented to Stuart Corbett-Byers for the biggest achievement in the club’s hundred and fifty years. It also marked two league trophies in two years for the side and a 2011 league and cup double with the SCU Trophy win the previous weekend. 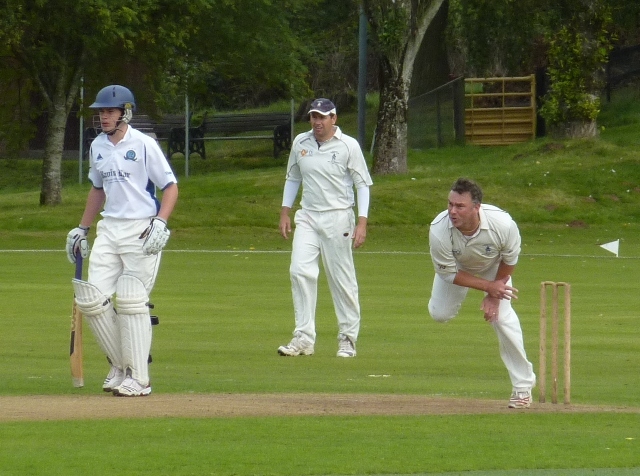 One more competition remains to be decided but Dumfries have an uphill task when they play Premiership winners Carlton in the Murgitroyd Scottish Twenty20 semi-final this Sunday at Shawholm.